weight you plan on putting on it? Minimally it should be able to extend to your height if not about 1 foot higher. In other words if you are 6′ tall it should be able to extend to a height of about 6′-7′. This is a very subjective opinion but there you have it. Do remember that the longer it is capable of extending the heavier and bigger it is. Once you determine how much height you need the next consideration is locking mechanisms: how will the legs lock into place. There are essentially three choices on the market: twist locks, flip locks, and wing screws/nuts. IMHO The only manufacturer with a history of great twist locks has been Gitzo. They lock very very tight and worked they way they were supposed to and last (seemingly) forever. Short of Gitzo, I have not seen any manufacturers do well with this mechanism; the mechanism is prone to problems when dust or sand get into the threads. When this happens the legs do not lock in place very well. Another problem among new manufacturers is that direction in which you need to twist isn't always "lefty loosy, righty tighty". And in some cases if you are twisting in the wrong direction too long the leg falls out and next thing you know you can't get it all back together! This I have never seen on a Gitzo. The disadvantage of twist locks is that they are very very slow to engage. The next locking mechanism are flip locks. These are great because they are very fast to engage and easy to use, just flip to release, and flip to lock. They are not prone to sand problems however over time they may loosen their grip. Many (but not all) have the ability to adjust this if the flip lock has loosened up. If you choose a flip lock tripod make sure there is a way to tighten it back over time. The last mechanism are screw locks. Although this is slower to engage than flip locks, they are not prone to any of the problems mentioned above with either the twist or flip locks. Even if sand is introduced into the system, it really isn’t a problem. They also do not loosen over time. You just twist until your system is locked. Although, it's very difficult to find a screw lock these days. The conclusion? If your budget is not a concern get a Gitzo, otherwise get flip locks. If you want longevity get screw locks. Update Nov 2015 - this post, along with the tripod head post, has been very popular on our site and since we posted it questions have arisen about brands. Which brand would we recommend. Over the past 5 years or so we have seen a number of manufacturers of tripod heads and legs sprout up, some from China, US and UK. Notably the ones not from China are very expensive and bill themselves as the latest and the greatest. The problem is that they do not have any track record. Although they seem fairly well built, a tripod and the head should last a lifetime, unless you are throwing off the roof of your house. Many of the reviews that we have read on line are from reviewers who have only used the product for a short period of time (less than a week or two). This is just simply not enough time to really test the gear. The other issue is that the average amateur photographer uses their tripod only a dozen times a year at the most (of course there are exceptions), which is also not a true test of the equipment. Now that some of these companies have had a few years on the ground and we have seen many of them out on Photo Safari, what we can tell you is that many of these brands are not living up to their price. We can not recommend against a brand (for obvious reasons) however what we can say is that all of our photographers either use Manfrotto (formally known as Bogen) or Gitzo. And they have had their tripods for over 10 years. Although it is true that the lower end Manfrotto does seem rather flimsy so we would recommend something over $100 just to be safe. If you are looking at making a purchase simply look at the item and ask yourself, "can I drop this 5 feet?" If the answer is yes, then buy it. 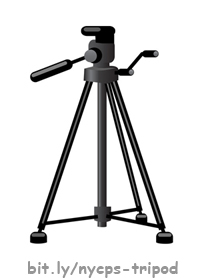 Click here for information about tripod heads and monopods.